غنی زاده, علیرضا, توانا املشی, امیر. (1396). پیش‌بینی مدول برجهندگی خاک‌های ریزدانه با استفاده از شبکه عصبی مصنوعی، ماشین بردار پشتیبان و سیستم استنتاج تطبیقی عصبی-فازی بهینه‌سازی‌شده با الگوریتم ازدحام ذرات. فصلنامه علمی - پژوهشی مهندسی حمل و نقل, 9(ویژه نامه روسازی), 159-181. علیرضا غنی زاده; امیر توانا املشی. "پیش‌بینی مدول برجهندگی خاک‌های ریزدانه با استفاده از شبکه عصبی مصنوعی، ماشین بردار پشتیبان و سیستم استنتاج تطبیقی عصبی-فازی بهینه‌سازی‌شده با الگوریتم ازدحام ذرات". فصلنامه علمی - پژوهشی مهندسی حمل و نقل, 9, ویژه نامه روسازی, 1396, 159-181. غنی زاده, علیرضا, توانا املشی, امیر. (1396). 'پیش‌بینی مدول برجهندگی خاک‌های ریزدانه با استفاده از شبکه عصبی مصنوعی، ماشین بردار پشتیبان و سیستم استنتاج تطبیقی عصبی-فازی بهینه‌سازی‌شده با الگوریتم ازدحام ذرات', فصلنامه علمی - پژوهشی مهندسی حمل و نقل, 9(ویژه نامه روسازی), pp. 159-181. غنی زاده, علیرضا, توانا املشی, امیر. پیش‌بینی مدول برجهندگی خاک‌های ریزدانه با استفاده از شبکه عصبی مصنوعی، ماشین بردار پشتیبان و سیستم استنتاج تطبیقی عصبی-فازی بهینه‌سازی‌شده با الگوریتم ازدحام ذرات. فصلنامه علمی - پژوهشی مهندسی حمل و نقل, 1396; 9(ویژه نامه روسازی): 159-181. مدول برجهندگی خاک بستر ازجمله پارامترهای بسیار مهم در تحلیل و طراحی روسازی‌ است. این پارامتر هم در روش‌های تجربی (مانند اشتو 1993) و هم در روش‌های مکانیستیک-تجربی (مانند MEPDG) به عنوان اصلی‌ترین پارامتر برای بیان مقاومت و خصوصیات مکانیکی خاک بستر مورداستفاده قرار می‌گیرد. برای تعیین این پارامتر نیاز است تا آزمایش بارگذاری سه محوری دینامیک تحت تنش‌های محدود‌کننده و تنش‌های انحرافی مختلف بر روی خاک انجام شود که انجام این آزمایش‌ها بسیار وقت‌گیر و پرهزینه است. در این مقاله عملکرد سه روش ترکیبی هوش محاسباتی شامل شبکه عصبی مصنوعی بهینه‌سازی شده با الگوریتم ازدحام ذرات (ANN-PSO)، ماشین بردار پشتیبان بهینه‌سازی شده با الگوریتم ازدحام ذرات (SVM-PSO) و سیستم استنتاج تطبیقی عصبی-فازی بهینه‌سازی شده با الگوریتم ازدحام ذرات (ANFIS-PSO) به‌منظور پیش‌بینی مدول برجهندگی مصالح خاک بستر ریزدانه مورد ارزیابی قرار گرفته است و نتایج این سه روش با یکدیگر مقایسه گردیده‌ است. 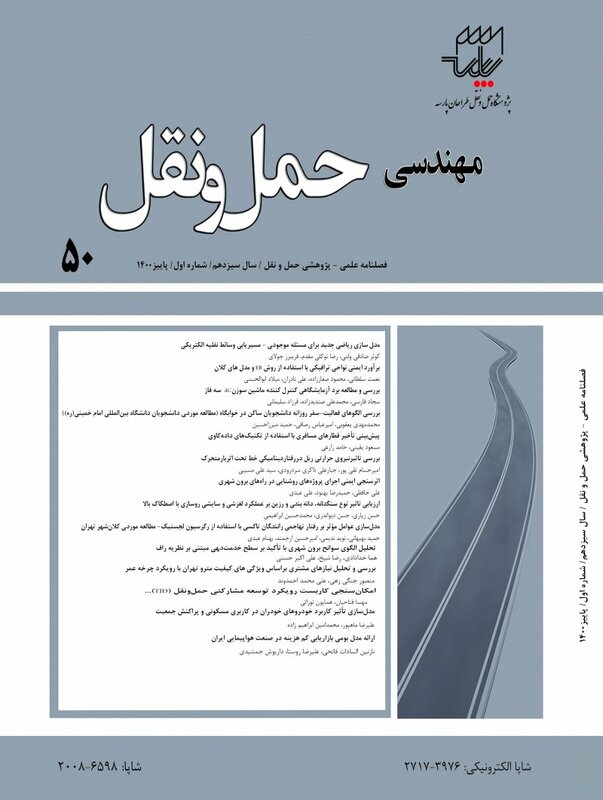 در کلیه این مدل‌ها درصد عبوری از الک نمره 200، حد روانی، شاخص خمیری، درصد رطوبت بهینه، درصد رطوبت، درجه اشباع، مقاومت فشاری تک‌محوری، تنش محدودکننده و تنش انحرافی به عنوان ورودی و مدول برجهندگی به عنوان پارامتر خروجی در نظر گرفته شد. نتایج این تحقیق نشان می‌دهد که روش ANN-PSO بیش‌ترین دقت را در پیش‌بینی مدول برجهندگی خاک‌های ریزدانه فراهم می‌سازد. ضریب رگرسیون حاصل از این روش برای مجموع کل داده‌ها برابر با 992/0 است و این روش در اکثر موارد مقدار مدول برجهندگی را با درصد خطای کمتر از 20 درصد پیش‌بینی می‌کند. ضریب رگرسیون حاصل از دو روش SVM-PSO وANFIS-PSO به ترتیب برابر با 989/0 و 951/0 است. نتایج این تحقیق همچنین نشان داد که درصد مصالح عبوری از الک نمره 200 بیشترین تأثیر و پارامتر تنش انحرافی کمترین تأثیر را بر روی مدول برجهندگی مصالح خاکی ریزدانه دارند. -AASHTO )1986" (Standard specifications for transportation materials and methods of sampling and testing",Washington, DC: AASHTO. -Coleri, E., Guler, M., Gungor, A. and Harvey, J. (2010) "Prediction of subgrade resilient modulus using genetic algorithm and curve-shifting methodology: Alternative to nonlinear constitutive models", Transportation Research Record, Journal of the Transportation Research Board, Vol. 2170, pp. 64-73. -Dibike, Y. B., Velickov, S., Solomatine, D. and Abbott, M.B. (2001) "Model induction with support vector machines: introduction and applications", Journal of Computing in Civil Engineering, Vol. 15, No. 3 , pp. 208-216. -Eberhart, Russ C. and Kennedy, James (1995) "A new optimizer using particle swarm theory", Proceedings of the sixth international symposium on micro machine and human science, New York, pp. 39-43. -Freeman, James A. and Skapura, David M. (1992) "Neural Networks: Algorithms, Applications and Programming Techniques", Addison-Wesley Publishing Company. -George, K. (1992) "Resilient testing of soils using gyratory testing machine", Transportation Research Record, Journal of Transportation Research Board, Vol. 1369, pp. 63-72. -George, K..P (2004) "Prediction of resilient modulus from soil index properties", Washington, DC, Rep. No. FHWA/MS-DOT-RD-04-172, Federal Highway Administration, U.S. Department of Transportation. -Ghanizadeh, A..R. and Rahrovan, M. (2016) "Application of artifitial neural network to predict the resilient modulus of stabilized base subjected to wet-dry cycles", Computations and Materials in Civil Engineering, Vol. 1, No. 1, pp. 37-47. -Hanittinan, Wichai (2007) "Resilient modulus prediction using neural network algorithm", (PhD Thesis),The Ohio State University. -Haykin, Simon S. (2001) "Neural networks: a comprehensive foundation", Tsinghua University Press. -Hu, C.H. (2011) "Prediction of resilient modulus for hot mix asphalt based on artificial neural network", Advanced Materials Research, Trans Tech Publ, Vol. 304, pp. 18-23. -Jang, J. S. R. (1993) "ANFIS: adaptive-network-based fuzzy inference system", IEEE Transactions On Systems, Man, And Cybernetics, Vol. 23, No. 3, pp. 665-685. -Kennedy James and Eberhart, Russ C. (1995) "Particle swarm optimization", Proceedings of IEEE international conference on neural networks, pp. 1942–1948. -Kezhen, Y., Yin, H., Liao, H. and Huang, L. (2011) "Prediction of resilient modulus of asphalt pavement material using support vector machine", ASCE, Geotechnical Special Publication, Vol. 213, pp.16-23. -Khazanovich, L., Celauro, C., Chadbourn, B., Zollars, J. and Dai, S. (2006) "Evaluation of subgrade resilient modulus predictive model for use in mechanistic-empirical pavement design guide", Transportation Research Record, Journal of the Transportation Research Board, Vol. 1947, pp. 155-166. -Kim, D.-S., Kweon, G.-C. and Lee, K. H. (1997) "Alternative method of determining resilient modulus of compacted subgrade soils using free-free resonant column test", Transportation Research Record, Journal of the Transportation Research Board, Vol. 1577, pp. 62-69. -Kim, D. S., Stokoe, I. and Kenneth, H. (1992) "Characterization of resilient modulus of compacted subgrade soils using resonant column and torsional shear tests", Transportation Research Record, Advances in Geotechnical Engineering, Vol. 1369, pp. 83-91. -Kim, S.-H., Yang, J., Jeong, J.H. (2014) "Prediction of subgrade resilient modulus using artificial neural network", KSCE Journal of Civil Engineering, Vol.18, No.5, pp. 1372-1379. -Maalouf, M., Khoury, N., Laguros, J.G., Kumin, H. (2012) "Support vector regression to predict the performance of stabilized aggregate bases subject to wet–dry cycles", International journal for numerical and analytical methods in geomechanics, Vol. 36, No. 6, pp. 675-696. -Maalouf, M., Khoury, N., Trafalis, T.B. (2008) "Support vector regression to predict asphalt mix performance", International journal for numerical and analytical methods in geomechanics, Vol. 32, No. 16, pp. 1989-1996. -Mohammad, L., Huang, B., Puppala, A. and Allen, A. (1999) "Regression model for resilient modulus of subgrade soils", Transportation Research Record, Journal of the Transportation Research Board, Vol. 1687, pp. 47-54. -Nazzal, M. D. and Tatari, O. (2013) "Evaluating the use of neural networks and genetic algorithms for prediction of subgrade resilient modulus", International Journal of Pavement Engineering, Vol. 14, No. 4, pp. 364-373. -NCHRP (2004) "Guide for mechanistic–empirical design of new and rehabilitated pavement structures", Washington, Dc, Final Report for Project 1-37a. -Ozsahin, T.S. and Oruc, S. (2008) "Neural network model for resilient modulus of emulsified asphalt mixtures", Construction and Building Materials, Vol. 22, No. 7, pp. 1436-1445. -Pal, M. and Deswal, S. (2014) "Extreme learning machine based modeling of resilient modulus of subgrade soils", Geotechnical and Geological Engineering, Vol. 32, No. 2, pp. 287-296. -Park, H., Kweon, G. and Lee, S. (2009) "Prediction of resilient modulus of granular subgrade soils and subbase materials using artificial neural network", Road Materials and Pavement Design, Vol. 10, No. 3, pp. 647-665. -Pourtahmasb, M. S., Karim, M. R. and Shamshirband, S. (2015) "Resilient modulus prediction of asphalt mixtures containing Recycled Concrete Aggregate using an adaptive neuro-fuzzy methodology", Construction and Building Materials, Vol. 82, pp. 257-263. -Rumelhart, D.E., Hintont, G.E. and Williams, R.J. (1986) "Learning representations by back-propagating errors", Nature, Vol. 323, pp. 533-536. -Sadrossadat, E., Heidaripanah, A. and Osouli, S. (2016) "Prediction of the resilient modulus of flexible pavement subgrade soils using adaptive neuro-fuzzy inference systems", Construction and Building Materials,Vol. 123, pp. 235-247. -Sadrossadat, E., Heidaripanah, A. and Ghorbani, B. (2016) "Towards application of linear genetic programming for indirect estimation of the resilient modulus of pavements subgrade soils", Road Materials and Pavement Design, Vol. 17, pp. 1-15. -Samui, P. (2008) "Support vector machine applied to settlement of shallow foundations on cohesionless soils", Computers and Geotechnics, Vol. 35, No. 3, pp. 419-427. -Shafabakhsh, G. and Tanakizadeh, A. (2015) "Investigation of loading features effects on resilient modulus of asphalt mixtures using Adaptive Neuro-Fuzzy Inference System", Construction and Building Materials, Vol. 76, pp. 256-263. -Shi, Yuhui and Eberhart, Russell (1998) "A modified particle swarm optimizer", Evolutionary Computation Proceedings, IEEE World Congress on Computational Intelligence, The 1998 IEEE International Conference, pp. 69-73. -Solanki, P. (2013) "Artificial neural network models to estimate resilient modulus of cementitiously stabilized subgrade soils", International Journal of Pavement Research and Technology, Vol.6, No. 3, pp. 155-164. -Solanki, P., Ebrahimi, A. and Zaman, M. M. (2008) "Statistical models for determination of the resilient modulus of subgrade soils", International Journal of Pavement Research and Technology, Vol. 1, No. 3, pp. 85-93. -Solanki, P., Zaman, M. and Ebrahimi, A. (2009) "Regression and artificial neural network modeling of resilient modulus of subgrade soils for pavement design applications", Intelligent and Soft Computing in Infrastructure Systems Engineering, Volume 259 of the series Studies in Computational Intelligence, pp. 269-304. -Takagi, T. and Sugeno, M. (1985) "Fuzzy identification of systems and its applications to modeling and control", IEEE transactions on systems, man, and cybernetics, Vol. 1, pp. 116-132. -Tutumluer, E. and Meier, R. (1996) "Attempt at resilient modulus modeling using artificial neural networks", Transportation Research Record, Journal of the Transportation Research Board, Vol. 1540, pp. 1-6. -Vadood, M., Johari, M. S. and Rahai, A. (2015) "Developing a hybrid artificial neural network-genetic algorithm model to predict resilient modulus of polypropylene/polyester fiber-reinforced asphalt concrete", The Journal of The Textile Institute, Vol. 106, No. 11, pp. 1239-1250. -Vapnik, V., Golowich, S. E. and Smola, A. (1997) "Support vector method for function approximation, regression estimation, and signal Processing", Advances In Neural information Processing Systems, pp. 281-287. -Vapnik, Vladimir Naumovich and Vapnik, Vladimir (1998) "Statistical learning theory", New York, Wiley. -Werbos, Paul J. (1974) "Beyond regression: new tools for prediction and analysis in the behavioral sciences", (PHD Dissertation), Harvard University, Cambridge. -Witczak, M.W., Qi, X. and Mirza, M. W. (1995) "Use of nonlinear subgrade modulus in AASHTO design procedure", Journal of Transportation Engineering, Vol. 121, No. 3, pp. 273-282. -Yuan, Z., Wang, L. N. and Ji, X. (2014) "Prediction of concrete compressive strength: Research on hybrid models genetic based algorithms and ANFIS", Advances in Engineering Software, Vol. 67, pp. 156-163. -Zaman, M., Solanki, P., Ebrahimi, A. and White, L. (2010) "Neural network modeling of resilient modulus using routine subgrade soil properties", International Journal of Geomechanics, Vol. 10, No. 1, pp. 1-12.